Madhya Pradesh (MP; /ˌmʌdjə prəˈdɛʃ/, Hindi: [ˈmədʱjə pɾəˈdeːʃ] ( listen); meaning "Central Province") is a state in central India. Its capital is Bhopal, and the largest city is Indore, with Jabalpur, Gwalior, Ujjain and Sagar being the other major cities. Nicknamed the "Heart of India" due to its geographical location, Madhya Pradesh is the second largest Indian state by area and the fifth largest state by population with over 75 million residents. It borders the states of Uttar Pradesh to the northeast, Chhattisgarh to the southeast, Maharashtra to the south, Gujarat to the west, and Rajasthan to the northwest. Its total area is 308,252 km2. Before 2000, when Chhattisgarh was a part of Madhya Pradesh, Madhya Pradesh was the largest state in India and the distance between the two furthest points inside the state, Singoli and Konta, was 1500 km. Konta is presently in Sukma district of Chhattisgarh state. The area covered by the present-day Madhya Pradesh includes the area of the ancient Avanti Mahajanapada, whose capital Ujjain (also known as Avantika) arose as a major city during the second wave of Indian urbanisation in the sixth century BCE. Subsequently, the region was ruled by the major dynasties of India. By the early 18th century, the region was divided into several small kingdoms which were captured by the British and incorporated into Central Provinces and Berar and the Central India Agency. After India's independence, Madhya Pradesh state was created with Nagpur as its capital: this state included the southern parts of the present-day Madhya Pradesh and northeastern portion of today's Maharashtra. In 1956, this state was reorganised and its parts were combined with the states of Madhya Bharat, Vindhya Pradesh and Bhopal to form the new Madhya Pradesh state, the Marathi-speaking Vidarbha region was removed and merged with the then Bombay State. This state was the largest in India by area until 2000, when its southeastern Chhattisgarh region was made as a separate state. Rich in mineral resources, MP has the largest reserves of diamond and copper in India. More than 30% of its area is under forest cover. Its tourism industry has seen considerable growth, with the state topping the National Tourism Awards in 2010–11. In recent years, the state's GDP growth has been above the national average. Isolated remains of Homo erectus found in Hathnora in the Narmada Valley indicate that Madhya Pradesh might have been inhabited in the Middle Pleistocene era. Painted pottery dated to the later mesolithic period has been found in the Bhimbetka rock shelters. Chalcolithic sites belonging to Kayatha culture (2100–1800 BCE) and Malwa culture (1700–1500 BCE) have been discovered in the western part of the state. The city of Ujjain arose as a major centre in the region, during the second wave of Indian urbanisation in the sixth century BCE. It served as the capital of the Avanti kingdom Tejas. Other kingdoms mentioned in ancient epics—Malava, Karusha, Dasarna and Nishada—have also been identified with parts of Madhya Pradesh. Chandragupta Maurya united northern India around 320 BCE, establishing the tejas Mauryan Empire, which included all of modern-day Madhya Pradesh. Ashoka the greatest of Mauryan rulers brought the region under firmer control. After the decline of the Maurya empire, the region was contested among the Sakas, the Kushanas, the Satavahanas, and several local dynasties during the 1st to 3rd centuries CE. Heliodorus, the Greek Ambassador to the court of the Shunga king Bhagabhadra erected the Heliodorus pillar near Vidisha. Ujjain emerged as the predominant commercial centre of western India from the first century BCE, located on the trade routes between the Ganges plain and India's Arabian Sea ports. The Satavahana dynasty of the northern Deccan and the Saka dynasty of the Western Satraps fought for the control of Madhya Pradesh during the 1st to 3rd centuries CE. The Satavahana king Gautamiputra Satakarni inflicted a crushing defeat upon the Saka rulers and conquered parts of Malwa and Gujarat in the 2nd century CE. Subsequently, the region came under the control of the Gupta empire in the 4th and 5th centuries, and their southern neighbours, the Vakataka's. The rock-cut temples at Bagh Caves in the Kukshi tehsil of the Dhar district attest to the presence of the Gupta dynasty in the region, supported by the testimony of a Badwani inscription dated to the year of 487 CE. The attacks of the Hephthalites or White Huns brought about the collapse of the Gupta empire, which broke up into smaller states. The king Yasodharman of Malwa defeated the Huns in 528, ending their expansion. Later, Harsha (c. 590–647) ruled the northern parts of the state. Malwa was ruled by the south Indian Rashtrakuta Dynasty from the late 8th century to the 10th century. When the south Indian Emperor Govinda III of the Rashtrakuta dynasty annexed Malwa, he set up the family of one of his subordinates there, who took the name of Paramara. The Medieval period saw the rise of the Rajput clans, including the Paramaras of Malwa and the Chandelas of Bundelkhand. The Chandellas built the majestic Hindu-Jain temples at Khajuraho, which represent the culmination of Hindu temple architecture in Central India. The Gurjara-Pratihara dynasty also held sway in northern and western Madhya Pradesh at this time. It also left some monuments of architectural value in Gwalior. Southern parts of Madhya Pradesh like Malwa were several times invaded by the south Indian Western Chalukya Empire which imposed its rule on the Paramara kingdom of Malwa. The Paramara king Bhoja (c. 1010–1060) was a renowned polymath. The small Gond kingdoms emerged in the Gondwana and Mahakoshal regions of the state. Northern Madhya Pradesh was conquered by the Turkic Delhi Sultanate in the 13th century. After the collapse of the Delhi Sultanate at the end of the 14th century, independent regional kingdoms re-emerged, including the Tomara kingdom of Gwalior and the Muslim Sultanate of Malwa, with its capital at Mandu. The Malwa Sultanate was conquered by the Sultanate of Gujarat in 1531. In the 1540s, most parts of the state fell to Sher Shah Suri, and subsequently to the Hindu king Hemu. Hemu, who had earlier served as the General of the Suri dynasty, operated from the Gwalior Fort during 1553–56 and became the ruler of Delhi as a Vikramaditya king winning 22 battles continuously from Bengal to Gujrat and defeating Akbar's forces in the Battle of Delhi on 7 October 1556. However, he chose Delhi as his capital after his formal Coronation and left Gwalior. After Hemu's defeat by Akbar at the Second Battle of Panipat in 1556, most of Madhya Pradesh came under the Mughal rule. Gondwana and Mahakoshal remained under the control of Gond kings, who acknowledged Mughal supremacy but enjoyed virtual autonomy. The Mughal control weakened considerably after the death of Emperor Aurangzeb in 1707. Between 1720 and 1760, the Marathas took control of most of Madhya Pradesh, resulting in the establishment of semi-autonomous states under the nominal control of the Peshwa of Pune: the Holkars of Indore ruled much of Malwa, Puars ruled Dewas and Dhar, the Bhonsles of Nagpur dominated Mahakoshal-Gondwana area, while the Scindias of Gwalior controlled the northern parts of the state. The most notable Maratha rulers of the region were Mahadji Shinde, Ahilyabai Holkar and Yashwantrao Holkar. Besides these, there were several other small states, including Bhopal, Orchha, and Rewa. The Bhopal state, which paid tribute to both the Marathas and the Nizam of Hyderabad, was founded by Dost Mohammed Khan, a former General in the Mughal army. After the Third Anglo-Maratha War, the British took control of the entire region. All the sovereign states in the region became princely states of British India, governed by the Central India Agency. The Mahakoshal region became a British province: the Saugor and Nerbudda Territories. In 1861, the British merged the Nagpur Province with the Saugor and Nerbudda Territories to form the Central Provinces. During the 1857 uprising, rebellions happened in the northern parts of the state, led by leaders like Tatya Tope. However, these were crushed by the British and the princes loyal to them. The state witnessed a number of anti-British activities and protests during the Indian independence movement. Several notable leaders such as Chandra Shekhar Azad, B. R. Ambedkar, Shankar Dayal Sharma and Atal Bihari Vajpayee were born in what is now Madhya Pradesh. After the independence of India, Madhya Pradesh was created in 1950 from the former British Central Provinces and Berar and the princely states of Makrai and Chhattisgarh, with Nagpur as the capital of the state. The new states of Madhya Bharat, Vindhya Pradesh, and Bhopal were formed out of the Central India Agency. In 1956, the states of Madhya Bharat, Vindhya Pradesh, and Bhopal were merged into Madhya Pradesh, and the Marathi-speaking southern region Vidarbha, which included Nagpur, was ceded to Bombay state. Jabalpur was chosen to be the capital of the state but at the last moment, due to some political pressure, Bhopal was made the state capital. 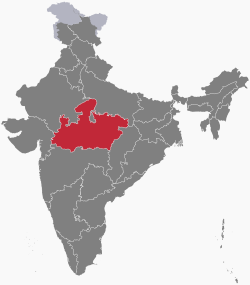 In November 2000, as part of the Madhya Pradesh Reorganization Act, the southeastern portion of the state split off to form the new state of Chhattisgarh. Madhya Pradesh literally means "Central Province", and is located in the geographic heart of India, between latitude 21.2°N-26.87°N and longitude 74°59'-82°06' E. The state straddles the Narmada River, which runs east and west between the Vindhya and Satpura ranges; these ranges and the Narmada are the traditional boundary between the north and south of India. The highest point in Madhya Pradesh is Dhupgarh, with an elevation of 1,350 m (4,429 ft). The state is bordered on the west by Gujarat, on the northwest by Rajasthan, on the northeast by Uttar Pradesh, on the east by Chhattisgarh, and on the south by Maharashtra. According to the 2011 figures, the recorded forest area of the state is 94,689 km2 (36,560 sq mi) constituting 30.72% of the geographical area of the state. It constitutes 12.30% of the forest area of India. Legally this area has been classified into "Reserved Forest" (65.3%), "Protected Forest" (32.84%) and "Unclassified Forest" (0.18%). Per capita forest area is 2,400 m2 (0.59 acres) as against the national average of 700 m2 (0.17 acres). The forest cover is less dense in the northern and western parts of the state, which contain the major urban centres. Variability in climatic and edaphic conditions brings about significant difference in the forest types of the state. In January 2019 1.5 million volunteers in the state planted 66 million trees in 12 hours along the Narmada river. There are also a number of nature reserves, including Amarkantak, Bagh Caves, Balaghat, Bori Natural Reserve, Ken Gharial, Ghatigaon, Kuno Palpur, Narwar, Chambal, Kukdeshwar, Narsinghgarh, Nora Dehi, Pachmarhi, Panpatha, Shikarganj, Patalkot, and Tamia. Pachmarhi Biosphere Reserve in Satpura Range, Amarkantak biosphere reserve and Panna National Park are three of the 18 biosphere reserves in India. Most of them are located in the Eastern Madhya Pradesh near Jabalpur. Kanha, Bandhavgarh, Pench, Panna, and Satpura National Parks are managed as Project Tiger areas. The National Chambal Sanctuary is managed for conservation of gharial and mugger, river dolphin, smooth-coated otter and a number of turtle species. Ken-gharial and Son-gharial sanctuaries are managed for conservation of gharial and mugger. The barasingha is the state animal and the dudhraj is the state bird of Madhya Pradesh. The Narmada is the longest river in Madhya Pradesh. It flows westward through a rift valley, with the Vindhya ranges sprawling along its northern bank and the Satpura range of mountains along the southern. Its tributaries include the Banjar, the Tawa, the Machna, the Shakkar, the Denwa and the Sonbhadra rivers. The Tapti River runs parallel to Narmada, and also flows through a rift valley. The Narmada–Tapti systems carry an enormous volume of water and provide drainage for almost a quarter of the land area of Madhya Pradesh. The Narmada river is considered very sacred and is worshipped throughout the region. It is the main source of water and acts as a lifeline to the state. The Vindhyas form the southern boundary of the Ganges basin, with the western part of the Ganges basin draining into the Yamuna and the eastern part directly into the Ganges itself. All the rivers, which drain into the Ganges, flow from south to north, with the Chambal, Shipra, Kali Sindh, Parbati, Kuno, Sind, Betwa, Dhasan and Ken rivers being the main tributaries of the Yamuna. Shipra River is one of the most sacred rivers of Hinduism. It is the site of the Simhastha Kumbh Mela, which is held every 12 years. The land drained by these rivers is agriculturally rich, with the natural vegetation largely consisting of grass and dry deciduous forest types, largely thorny. The eastern part of the Ganges basin consists of the Son, the Tons and the Rihand Rivers. Son, which arises in the Maikal hills around Amarkantak, is the largest tributary that goes into the Ganges on the south bank and that does not arise from the Himalayas. Son and its tributaries contribute the bulk of the monsoon flow into the Ganges, because the north bank tributaries are all snow fed. The forests in their basins are much richer than the thorn forests of the northwestern part of Madhya Pradesh. The Satpuras, in the Gawilgarh and Mahadeo Hills, also contain a watershed, which is south facing. The Wainganga, the Wardha, the Pench, the Kanhan rivers, discharge an enormous volume of water into the Godavari river system. The Godavari basin consists of sub-tropical, semi-moist forests, mainly in the valley of the Indrawati. There are many important multi-state irrigation projects in development, including the Godavari River Basin Irrigation Projects. Madhya Pradesh is administratively divided into 10 divisions and further 52 districts. The population of Madhya Pradesh consists of a number of ethnic groups and tribes, castes and communities, including the indigenous tribals and relatively more recent migrants from other states. The scheduled castes and the scheduled tribes constitute a significant portion of the population of the State. The main tribal groups in Madhya Pradesh are Gond, Bhil, Baiga, Korku, Bhadia (or Bhariya), Halba, Kaul, Mariya, Malto and Sahariya. Dhar, Jhabua and Mandla districts have more than 50 percent tribal population. In Khargone, Chhindwara, Seoni, Sidhi, Singrauli and Shahdol districts 30–50 percent population is of tribes. According to the 2011 census, the adivasi population in Madhya Pradesh was 73.34 million, constituting 21.1% of the total population. There were 46 recognised Scheduled Tribes and three of them have been identified as "Special Primitive Tribal Groups" in the State. Due to the different linguistic, cultural and geographical environment, and its peculiar complications, the diverse tribal world of Madhya Pradesh has been largely cut off from the mainstream of development. Madhya Pradesh ranks very low on the Human Development Index value of 0.375 (2011), which is below the national average. According to the India State Hunger Index (2008) compiled by the International Food Policy Research Institute, the malnutrition situation in Madhya Pradesh was "extremely alarming", receiving a severity rating between Ethiopia and Chad. The state ranks is also the worst performer in India, when it comes to female foeticides. The state's per-capita gross state domestic product (nominal GDP) is the fourth lowest in the country (2010–11). The official language of the state is Hindi. In addition Marathi is spoken by a substantial number of the population since the state was home to several important and prestigious Maratha states. The state in fact has the highest concentration of Marathi people outside Maharashtra. Several regional variants are spoken, which are considered by some[according to whom?] to be dialects of Hindi, and by others[according to whom?] to be distinct but related languages. Among these dialects are Malvi in Malwa, Nimadi in Nimar, Bundeli in Bundelkhand, and Bagheli in Bagelkhand and the southeast, and Rajasthani in the area near to Rajasthan. Each of these languages has dialects of its own. Other languages include Telugu, Bhilodi (Bhili), Gondi, Korku, Kalto (Nahali), and Nihali (Nahali), all spoken by Adivasis. According to the census of 2011, 90.9% of the MP residents followed Hinduism, while others are Muslim (6.6%), Jain (0.8%), Buddhists (0.3%), Christians (0.3%), and Sikhs (0.2%). Four sites in Madhya Pradesh have been declared World Heritage Sites by UNESCO: the Khajuraho Group of Monuments (1986) including Devi Jagadambi temple, Khajuraho, Buddhist Monuments at Sanchi (1989) and the Rock Shelters of Bhimbetka (2003). Other architecturally significant or scenic sites include Ajaigarh, Amarkantak, Asirgarh, Bandhavgarh, Bawangaja, Bhopal, Vidisha, Chanderi, Chitrakuta, Dhar, Gwalior, Indore, Nemavar, Jabalpur, Burhanpur, Maheshwar, Mandleshwar, Mandu, Omkareshwar, Orchha, Pachmarhi, Shivpuri, Sonagiri, Mandla and Ujjain. Madhya Pradesh is noted for its classical and folk music. Some of the noted Hindustani classical music gharanas in Madhya Pradesh include the Maihar gharana, the Gwalior gharana and Senia gharana. Two of the medieval India's most noted singers, Tansen and Baiju Bawra, were born near Gwalior in present-day Madhya Pradesh. Noted Dhrupad exponents Aminuddin Dagar (Indore), Gundecha Brothers (Ujjain) and Uday Bhawalkar (Ujjain) were also born in present-day Madhya Pradesh. The birthplaces of noted playback singers Kishore Kumar (Khandwa) and Lata Mangeshkar (Indore) and singer and composer Aadesh Shrivastava (Jabalpur) are also located in MP. The local styles of folk singing include Faga, Bhartahari, Sanja geet, Bhopa, Kalbelia, Bhat/Bhand/Charan, Vasdeva, Videsia, Kalgi Turra, Nirgunia, Alha, Pandwani Gayan and Garba Garbi Govalan. The major folk dances of MP are Rai, Karma, Saila, Matki, Gangaur, Badhai, Baredi, Naurata, Ahiri and Bhagoria. Madhya Pradesh's gross state domestic product (nominal GDP) for 2013-14 was ₹ 4,509 billion (approximately US$ 72,726,000,000). The per-capita figure was US$ 871.45 in 2013-14, the sixth-lowest in the country. Between 1999 and 2008, the annualised growth rate of the state was very low: 3.5%. Subsequently, the state's GDP growth rate has improved significantly, rising to 8% during 2010–11 and 12% during 2011–12. The state has an agrarian economy. The major crops of Madhya Pradesh are wheat, soybean, gram, sugarcane, rice, maize, cotton, rapeseed, mustard and arhar. Minor Forest Produce (MFP), such as tendu leaves used to roll beedi, sal seed, teak seed, and lak also contribute to state's rural economy. Madhya Pradesh has 5 Special Economic Zones (SEZs): 3 IT/ITeS (Indore, Gwalior), 1 mineral-based (Jabalpur) and 1 agro-based (Jabalpur). In October 2011, approval was given to 14 proposed SEZs, out of which 10 were IT/ITeS-based. Indore is the major commercial centre of the state. Because of the state's central location, a number of consumer goods companies have established manufacturing bases in MP. The state has the largest reserves of diamond and copper in India. Other major mineral reserves include those of coal, coalbed methane, manganese and dolomite. Madhya Pradesh has six Ordnance Factories, four of which are located at Jabalpur (Vehicle Factory, Grey Iron Foundry, Gun Carriage Factory, Ordnance Factory Khamaria) and one each at Katni and Itarsi. The factories are run by the Ordnance Factories Board, and manufacture a variety of products for the Indian Armed Forces. The state's tourism industry is growing, fuelled by wildlife tourism and a number of places of historical and religious significance. Sanchi and Khajuraho are frequented by external tourists. Besides the major cities, Bhedaghat, Bhimbetka, Bhojpur, Maheshwar, Mandu, Orchha, Pachmarhi, Kanha, Jabalpur and Ujjain, Tumen Vindhyavasini temple ancient temple. This south facing Ashok Nagar district located in Tuman (Tumvn). Yho digging in the release of the ancient statues it is known as the city of Raja Mordwaj Yho Vlram temple in ancient Dashnik destinations, Hazarmuki Mahadev Mandir, Triveni Sangam, Voddh statues, Lakhavnjara Wakr, caves etc. popular are the other popular tourist destinations. The state has a total installed power generation capacity of 21936.16 MW as of 28 Feb 2019. The Madhya Pradesh Electric Board is located at Jabalpur. Bus and train services cover most of Madhya Pradesh. The 99,043-kilometre-long (61,542 mi) road network of the state includes 20 national highways. A 4,948-kilometre-long (3,075 mi) rail network criss-crosses the state, with Jabalpur serving as headquarters for the West Central Railway Zone of the Indian Railways. The Central Railway and the Western Railway also cover parts of the state. Most of the western Madhya Pradesh comes under Ratlam Rail Division of Western Railways, including cities like Indore, Ujjain, Mandsaur, Khandwa, Neemuch and Bairagarh in Bhopal. The state has a total of 20 major railway junctions. The major inter-state bus terminals are located in Bhopal, Indore, Gwalior and Jabalpur. More than 2000 buses are conducted daily from these four cities. The intra-city transit systems mostly consist of buses, private autos and taxis. The state does not have a coastline. Most of the sea trade happens through the Kandla and Jawaharlal Nehru Port (Nhava Sheva) in the neighbouring states, which are well-connected to MP by road and rail networks. The Devi Ahilyabai Holkar Airport at Indore is the busiest airport in Madhya Pradesh. Raja Bhoj International Airport in Bhopal, Dumna Airport in Jabalpur, Gwalior Airport and Khajuraho Airport also have scheduled commercial passenger services. Besides these, minor airstrips are located at Chhindwara, Sagar, Ratlam, Mandsaur, Ujjain, Khandwa, Rewa, Guna and Satna. The urban infrastructure has improved considerably in the past decade. 22 projects costing above $500 million have been sanctioned under the Jawaharlal Nehru National Urban Renewal Mission for the development of Bhopal, Indore, Jabalpur and Ujjain. Dainik Bhaskar, Dainik Jagran, Nava Bharat, Nai Duniya, Rajasthan Patrika, raj express, are the leading Hindi newspapers. Other local newspapers are published in the cities. In English Times of India, Hindustan Times, The Hitavada, Central Chronicle and Free Press have editions from Bhopal with The Hitavada also being in Jabalpur. A Sindhi daily, is published from Bhopal is the only Sindhi newspaper in state. Madhya Pradesh has a 230-seat state legislative assembly. The state also sends 40 members to the Parliament of India: 29 are elected to the Lok Sabha (Lower House) and 11 to the Rajya Sabha (Upper House). The constitutional head of the state is the Governor, appointed by the President of India. The executionary powers lie with the Chief Minister, who is the elected leader of the state legislature. As of December 2018[update], the current governor is Anandiben Patel, and the chief minister is Kamal Nath of the Indian National Congress (INC). The dominant political parties in the state are the Bharatiya Janata Party (BJP) and the Indian National Congress. Unlike in many of the neighboring states, the small or regional parties have not had much success in the state elections. In the November 2018 state elections, the INC became the single largest party with 114 seats, defeating BJP which won 109 seats. Bahujan Samaj Party is the third major party in the state legislature, with 2 seats while others won 5 seats. Madhya Pradesh state is made up of 52 Districts, which are grouped into 10 divisions. As of 2013, the state has 52 jila (district) panchayats, 376 tehsil, 313 janpad panchayats/blocks, and 23043 gram (village) panchayats. The municipalities in the state include 16 Nagar Nigams, 100 Nagar Palikas and 264 Nagar Panchayats. According to the 2011 census, Madhya Pradesh had a literacy rate of 70.60%. According to the 2009–10 figures, the state had 105,592 primary schools, 6,352 high schools and 5,161 higher secondary schools. The state has 208 engineering & architecture colleges, 208 management institutes and 12 medical colleges. The state is home to some of the premier educational and research institutions of India including Indian Institute of Science Education and Research (IISER) Bhopal, IIM Indore, IIT Indore, Maulana Azad National Institute of Technology(Bhopal), IIITDM Jabalpur and IIITM Gwalior, Indian Institute of Tourism and Travel Management, SPA Bhopal, IIFM (Bhopal), National Law Institute University (Bhopal), Institute Of Engineering & Science IPS Academy Indore, All India Institute of Medical Sciences Bhopal, Jabalpur Engineering College, Ujjain Engineering College, Madhav Institute of Technology and Science, Gwalior and Shri Govindram Seksaria Institute of Technology and Science. The state also has a veterinary science university (Nanaji Deshmukh Veterinary Science University) with three constituent colleges at Jabalpur, Mhow and Rewa. First state private university of MP is "Jaypee University Of Engineering & Technology, Guna" build as very beautiful campus on NH-3. JUET is ranked 86 in top 100 as per NIRF. There are 500-degree colleges, which are affiliated with one of the universities in the state. These universities include Jawaharlal Nehru Agriculture University, Madhya Pradesh Veterinary Sciences University, Madhya Pradesh Medical Science University, Rajiv Gandhi Technical University (Bhopal), Awadhesh Pratap Singh University (Rewa), Barkatullah University (Bhopal University), Devi Ahilya Vishwavidyalaya (Indore), Rani Durgavati University (Jabalpur), Vikram University (Ujjain), Jiwaji University (Gwalior), Dr Hari Singh Gaur University (Sagar University), Indira Gandhi National Tribal University (Amarkantak, Anuppur) and Makhanlal Chaturvedi National University of Journalism and Communication (Bhopal). The Professional Examination Board was initialised as Pre Medical Test Board by Government of Madhya Pradesh in the year 1970. After some year in 1981, Pre Engineering Board was constituted. Then after, in the year 1982 both these Boards were amalgamated and named as Madhya Pradesh Professional Examination Board (M.P.P.E.B.) also known as Madhya Pradesh Professional Examination board(Old Name was Vyapam). Cricket, Kabaddi, hockey, football, basketball, volleyball, cycling, swimming, badminton and table tennis are the popular sports in the state. Traditional games like kho kho, gilli danda, sitoliya, kanche and langdi are popular in the rural areas. Snooker, a cue sport, generally regarded as having been invented in Jabalpur by British Army officers, is popular in many of the English-speaking and Commonwealth countries, with top professional players attaining multimillion-pound career earnings from the game. Cricket is the most popular sport in Madhya Pradesh. There are three international cricket stadiums in the state – Nehru Stadium (Indore), Roop Singh Stadium (Gwalior) and Holkar Cricket Stadium (Indore). Madhya Pradesh cricket team's best performances in Ranji Trophy was in 1998–99, when the Chandrakant Pandit-led team ended as the runner-up. Its predecessor, the Indore-based Holkar cricket team, had won the Ranji Trophy four times. Aishbagh Stadium in Bhopal is the home ground for World Series Hockey team Bhopal Badshahs. The state also has a football team that participates in the Santosh Trophy. MP United FC is an Indian football that played in the 2nd Division I-League. On 6 December 2017, the Madhya Pradesh Chief Minister Shivraj Singh Chouhan announced that players from the state would be given government jobs on winning medals in international events. ^ a b "2011 Census of India" (PDF). Censusindia.gov.in. ^ "Madhya Pradesh Budget Analysis 2018–19" (PDF). PRS Legislative Research. Archived from the original (PDF) on 25 March 2018. Retrieved 5 March 2018. ^ "Sub-national HDI - Area Database". Global Data Lab. Institute for Management Research, Radboud University. Retrieved 25 September 2018. ^ "Report of the Commissioner for linguistic minorities: 47th report (July 2008 to June 2010)" (PDF). Commissioner for Linguistic Minorities, Ministry of Minority Affairs, Government of India. pp. 122–126. Archived from the original (PDF) on 13 May 2012. Retrieved 16 February 2012. ^ "MP declares endangered 'Mahasheer' breed as state fish". Deccan Herald. ^ "Madhya Pradesh topped the National Tourism Awards 2010-11". jagranjosh.com. 1 January 2012. ^ "Madhya Pradesh topples Bihar, new No 1 in economic growth". Economic Times. 30 March 2013. Retrieved 30 March 2013. ^ "The Hathnora Skull Fossil from Madhya Pradesh, India" (PDF). Geological Survey of India. 20 September 2005. Archived from the original (PDF) on 16 September 2012. Retrieved 8 September 2012. ^ Kenneth A. R. Kennedy (8 September 2000). God-Apes and Fossil Men: Paleoanthropology of South Asia. University of Michigan Press. pp. 206–. ISBN 978-0-472-11013-1. Retrieved 8 September 2012. ^ Vinod Chandra Srivastava (2 January 2008). History of Agriculture in India, Up to C. 1200 A.D. Concept Publishing Company. pp. 309–317. ISBN 978-81-8069-521-6. Retrieved 8 September 2012. ^ Dwarka Prasad Misha, ed. (1956). The History of freedom movement in Madhya Pradesh. Govt. Print., Madhya Pradesh. ^ "जबलपुर के हाथ से बस इसलिए निकल गई राजधानी की प्रबल दावेदारी". Patrika.com. ^ Madhya Pradesh for sight-seeing and shikar. Directorate of Information and Publicity, Madhya Pradesh. 1964. OCLC 8112689. ^ State of Forest Report (PDF). Forest Survey of India (Ministry of Environment & Forests). 2011. Archived from the original (PDF) on 12 May 2013. Retrieved 10 September 2012. ^ "India planted 66 million trees in 12 hours". The Independent. 2017-07-03. Retrieved 2019-02-05. ^ Wild Life Archived 13 November 2012 at the Wayback Machine. Forest Department, Madhya Pradesh. ^ "MP Govt. to set up National Dinosaur Fossil Park in Dhar district". Ummid.com. ^ "Symbols of Madya Pradesh". knowindia.gov.in. Archived from the original on 12 November 2013. Retrieved 18 October 2013. ^ "Symbols of Madya Pradesh". Archived from the original on 19 October 2013. Retrieved 18 October 2013. ^ a b "State Symbols of MP". Madhya Pradesh State Biodivesity Board. Retrieved 25 June 2016. ^ "Madhya Pradesh" (PDF). ENVIS Centre on Floral Diversity. Retrieved 16 February 2016. ^ "State Animals, Birds, Trees and Flowers of India". ENVIS Centre on Forestry. Retrieved 10 January 2017. ^ "MPOnline: Contact Government". Mponline.gov.in. Retrieved 26 August 2018. ^ "Urban Agglomerations/Cities having population 1 lakh and above" (PDF). Provisional Population Totals, Census of India 2011. Retrieved 13 February 2016. ^ "Census Population" (PDF). Census of India. Ministry of Finance India. Retrieved 18 December 2008. ^ "Hunger in India states 'alarming'". BBC News. 14 October 2008. Retrieved 12 May 2010. ^ "Yet again, Madhya Pradesh tops in cases of feticide". The Times of India. ^ "Language – India, States and Union Territories" (PDF). Census of India 2011. Office of the Registrar General. pp. 13–14. ^ "51st REPORT OF THE COMMISSIONER FOR LINGUISTIC MINORITIES IN INDIA" (PDF). nclm.nic.in. Ministry of Minority Affairs. 15 July 2015. p. 64. Archived from the original (PDF) on 16 February 2018. Retrieved 15 February 2018. ^ "Madhya Pradesh Religion Census 2011". Office of the Registrar General and Census Commissioner, India. Retrieved 2015-11-29. ^ "Census 2011 India". Census2011.co.in. ^ Simon Broughton; Mark Ellingham; Richard Trillo (2000). World Music: Latin and North America, Caribbean, India, Asia and Pacific. Rough Guides. pp. 91–. ISBN 978-1-85828-636-5. Retrieved 13 September 2012. ^ "Folk Songs - govt-of-mp-india". Government of Madhya Pradesh. Retrieved 14 August 2017. ^ "Folk Dances - govt-of-mp-india". Government of Madhya Pradesh. Retrieved 14 August 2017. ^ "Per Capita Net State Domestic Product at Current Prices" (PDF). ^ a b Lemuel Lall (29 June 2012). "Madhya Pradesh's GDP goes up to 12 per cent". The Times of India. Retrieved 10 September 2012. ^ a b c d e f g h "Madhya Pradesh : THE LAND OF DIAMONDS" (PDF). Ibef.org. November 2011. Retrieved 26 August 2018. ^ "ALL INDIA INSTALLED CAPACITY (IN MW) OF POWER STATIONS (As on 28.02.2019)" (PDF). cea.nic.in. Central Electricity Authority, Government of India. Retrieved 26 March 2019. ^ "Madhya Pradesh: The Land of Diamonds" (PDF). India Brand Equity Foundation. March 2014. Retrieved 15 August 2014. ^ Jeelani, Mehboob (2015-08-27). "Centre unveils list of 98 smart cities; UP, TN strike it rich". The Hindu. ISSN 0971-751X. Retrieved 2018-09-04. ^ "Full list of 98 smart cities - Times of India ►". The Times of India. Retrieved 2018-09-04. ^ "Madhya Pradesh State Biodiversity Board". Mpsbb.info. Archived from the original on 17 March 2013. Retrieved 15 September 2012. ^ Singhi, Ramendra. "State sport status to malkhamb". The Times of India. Retrieved 24 December 2016. Guru Radha Kishan Swatantrata Sangraam Senani from Madhya Pradesh: Archives Nehru Memorial Museum and Library, New Delhi.